The peace-loving deity of the Hindu Trinity, Vishnu is the Preserver or Sustainer of life with his steadfast principles of order, righteousness and truth. 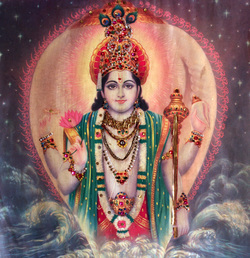 When these values are under threat, Vishnu emerges out of his transcendence to restore peace and order on earth. Vishnu’s earthly incarnations have 10 major avatars. The devout followers of Vishnu are called Vaishnavas, and his consort is Lakshmi. 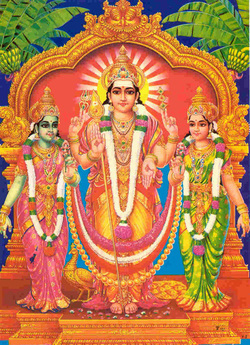 Vishnu is popularly worshipped as Lord Venkateshwara in the southern India. The most powerful and fascinating deity in Hinduism, who represents death and dissolution. One of the godheads in the Hindu Trinity, and known by many names - Mahadeva, Pashupati, Nataraja, Vishwanath, Bhole Nath - Shiva is perhaps the most complex of Hindu deities. Hindus recognise this by putting his shrine in the temple separate from those of other deities and worshipping Shiva as a phallic symbol called the ‘Shiva Limgam’ in most temples. 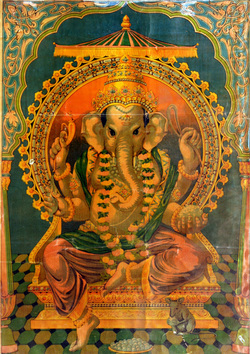 Easily recognizable as the elephant-deity riding a mouse, Ganesha is arguably he most popular Hindu God, and one of the commonest mnemonics for anything associated with Hinduism. The son of Shiva and Parvati, Ganesha is depicted has having a curved trunk and big ears, and a huge pot-bellied body of a human being. He is the lord of success and destroyer of evils and obstacles. He is also worshipped as the god of knowledge, wisdom and wealth. The Mother Goddess — known variously as Durga, Bhavani, Sherawali, Amba, Chandika, Gauri, Parvati, Vaishno Devi — represents the fiery powers of the gods. The name “Durga” means “inaccessible”, and she is the personification of the active side of the divine “shakti” energy of Lord Shiva. 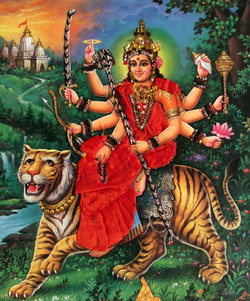 Durga is usually portrayed as riding a lion, and carrying weapons in her many arms. She is the protector of the righteous, and destroyer of the evil. 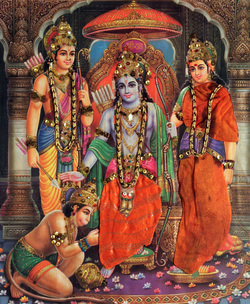 Rama, the perfect avatar of the Supreme Protector Vishnu, is an all-time favorite among Hindu deities. The most popular symbol of chivalry and virtue, Rama is “the embodiment of truth, of morality, the ideal son, the ideal husband, and above all, the ideal king." He is widely believed to be an actual historical figure - a "tribal hero of ancient India" - whose exploits form the great Hindu epic of Ramayana or The Romance of Rama. 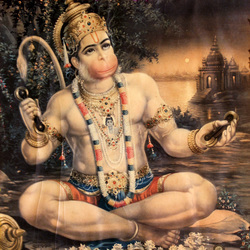 Hanuman, the mighty ape that aided Lord Rama in his expedition against evil forces, described in the epic Ramayana, is one of the most popular idols in the Hindu pantheon. Believed to be an avatar of Lord Shiva, Hanuman is worshipped as a symbol of physical strength, perseverance and devotion. In times of trouble, it is a common faith among Hindus to chant the name of Hanuman or sing his hymn - "Hanuman Chalisa". Hanuman temples are among the most common public shrines found in India. Saraswati, the goddess of knowledge and learning, represents the free flow of wisdom and consciousness. She is the mother of the Vedas, and chants to her, called the 'Saraswati Vandana' often begin and end Vedic lessons. The goddess of wisdom, art and music, she is the daughter of Lord Shiva and Goddess Durga. It is believed that goddess Saraswati endows human beings with the powers of speech, wisdom and learning. Goddess Lakshmi means "Good Luck" to Hindus. 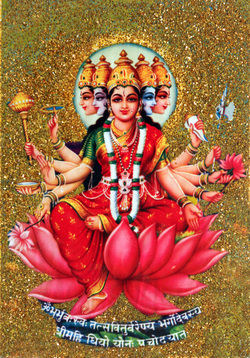 The word 'Lakshmi' is derived from the Sanskrit word Laksya, meaning 'aim' or 'goal', and she is the goddess of wealth and prosperity, both material and spiritual. She is the household goddess of most Hindu families, and a favorite of women. Lakshmi is depicted as a beautiful woman of golden complexion, with four hands, sitting or standing on a full-bloomed lotus and holding a lotus bud, which stands for beauty, purity and fertility. Kali, or the dark goddess, is the fearful and ferocious form of the mother goddess Durga. She is depicted as having born from the brow of Goddess Durga during one of her battles with the evil forces. Kali is represented with perhaps the fiercest features amongst all the world's deities. Her tongue protrudes from her mouth, her eyes are red, and her face and breasts are sullied with blood. She stands with one foot on the thigh, and another on the chest of her husband, Shiva. The great exponent of the Gita, Krishna is the ninth and the most complete avatar of Vishnu, the Godhead of the Hindu Trinity. Of all avatars he is the most popular and perhaps the one closest to the heart of the masses. This blue-skinned deity has influenced the Indian thought, life and culture in myriad ways - not only its religion and philosophy, but also into its mysticism and literature, painting and sculpture, dance and music, and all aspects of Indian folklore.